“The 2015 vintage is full of energy. The nose opens with a very expressive bouquet of summer fruit: dark cherry, raspberry and boysenberries with notes of vanilla and cinnamon. The attack is voluminous and round with layered blue fruits sustained by a hint of graphite on the long finish, bringing delicious minerality and freshness. The tannins are very fine and tightly knit. The ripeness of the fruit transitions effortlessly into intense dark and earthy aromas. 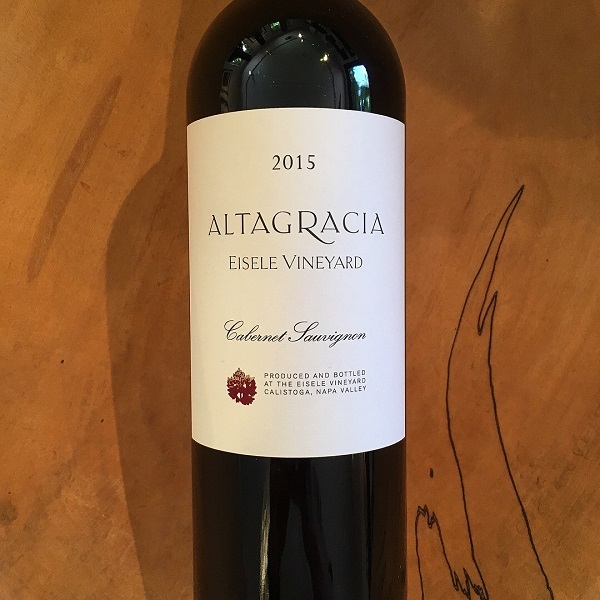 This is a great Altagracia with an outgoing personality.” Formerly known as Araujo Estate, the new owner, Francois Pinault and his team decided earlier this year to pay tribute to the forty vintages that carried the Eisele Vineyard designation, first with Joseph Phelps, Conn Creek and Ridge to finally Araujo. As the owner of famed Château Latour, Château-Grillet and Domaine d’Eugénie, Eisele Vineyard is Francois’s only winery in Napa Valley. The final blend is 88% Cabernet Sauvignon, 7% Cabernet Franc and 5% Petit Verdot. This is a gorgeous multi-layered, full-noted Cabernet with great pedigree for the price.